Hence why I’m focusing on my new favorite neighborhood in the Mapo-gu district, Yeonnam-dong, where despite places like Cafe Layered and this cartoon cafe are increasingly gaining traction, it’s still in a state of quiet calm. Yeonnam-dong is best described as Hongdae’s sophisticated sister (if you enjoy walking, it’s only a short trek from one to the other). 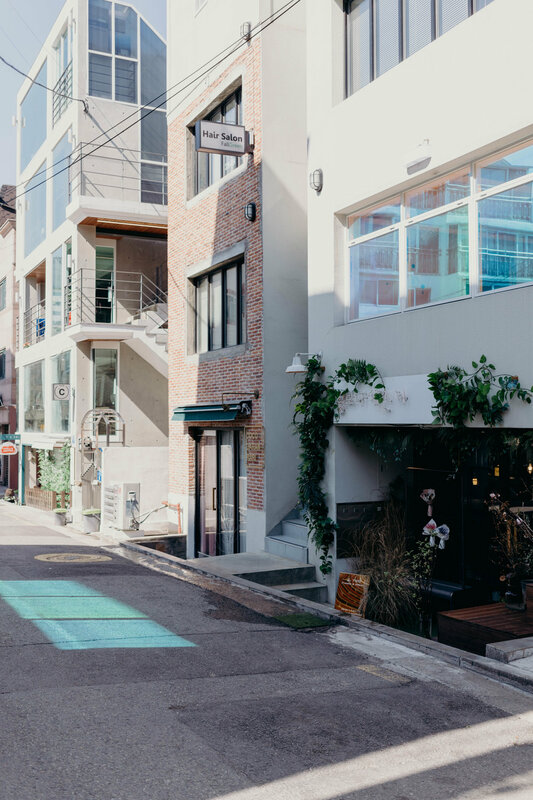 If Hongdae is a college area (and it very much is: Hong=Hongik, dae=daehakgyo or University), Yeonnam-dong would be a yuppie-town, where you can enjoy peaceful Saturday and Sunday morning brunches and coffees. Every time I’ve been, the few others who were around were exploring in hushed voices, as if it were a secret. It’s one I’d like to keep, if only for a moment, but as I love sharing places I’ve discovered, well, here we are. If you enter through the underpass and go right, you’ll find You Need My Yogurt (full post linked), a basement-level Greek yogurt shop with the prettiest interior. There are many basement-level shops in Yeonnam-dong with large windows that extend up to ground level and allow passers-by to peer in at what’s below. Next door is an old-school bakery that seems to always be poppin’. Keep winding through this part of Yeonnam-dong and you may find Little Forest, one of my new favorite healthy food spots. Seating is quite limited and the service is slow (in a good way), so be prepared for a wait depending on when you get there. I recommend the shrimp avocado toast (which has a slight spicy kick) and the Jessica Alba, a comically-named but delicious green juice. Andrew and I once split the shakshouka, which isn’t as good as the one we used to make at home in the States, but is still quite good. Next door to Little Forest is Ally Cameras, a vintage film camera shop with a proprietor who’s happy to show you around and let you play with the different cameras. Adjacent to that is a small flower shop, and to that, a macaron shop (coming soon). But if you enter through the underpass and go left, you’ll stumble upon my favorite cafe. I’ve waxed poetic about Green Melrose, probably still the prettiest cafe in Seoul, which you can see more of here (and here, and here). You can also get the deets on the cartoon cafe, Cafe Yeonnam-dong 223-14, one row of buildings in front of Green Melrose, here. Cafe Layered was practically a ghost town the first several times we explored Yeonnam-dong, but it’s suddenly exploded as the latest ‘hot’ cafe. It’s housed in a pretty red brick building, complete with a mailbox on the front pillar, resembling a suburban US home more than a Korean cafe. I haven’t been in and am not anxious to get caught in the fray of trend-followers, but thought it was worth mentioning. At the end of the block is Fluffy Doughnut, probably my favorite building in Yeonnam-dong. My favorite parts of Korea tend to be the ones that show the beauty of Korea, but my other favorite parts are the places that make you feel displaced. If anyone else remembers Flushing, NY in the ‘90s, that’s what this corner is. but this is where things get ‘underground’ and magical. First, you’ll pass Iphida on your left, a minimally designed and dreamy clothing store (opened just over a month ago) with racks of items in my exact color palette. My top selling points, though, are 1. that the proprietor doesn’t pressure you to make a purchase (a rarity) and 2. that every item in the shop has a unique and almost quirky detail to it. Take this blazer for instance. The clothing tends to be of a higher quality than the fast fashion Seoul is used to and feels carefully curated—it inspires me to create my own collections and even open my own store. On the right side of the road is the sweetest jewelry and assorted trinkets shop, Bombamdal (spring night moon), the perfect place to pick up handmade gifts. I especially love their mismatched/asymmetric earrings. If you peek between buildings, you’ll discover a whole new part of Yeonnam-dong. 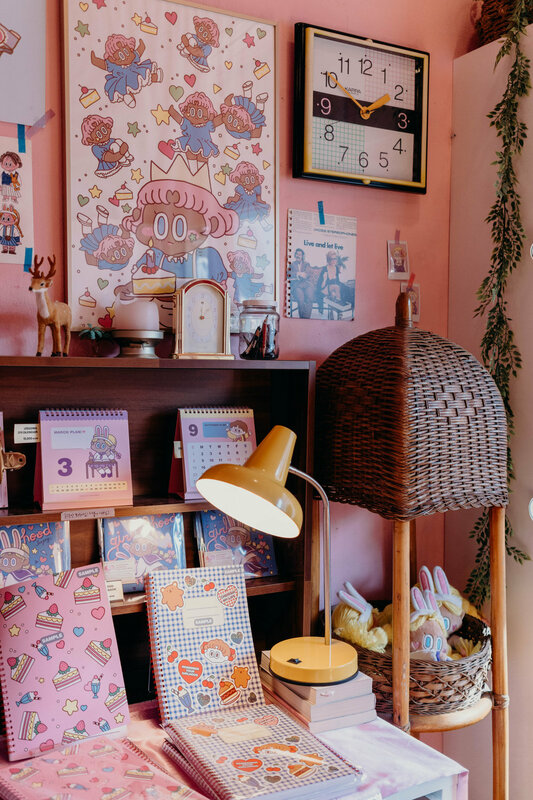 Standard Love Dance resembles an old-timey American movie theater painted entirely in pink, and is filled with stationery and other paraphernalia featuring the character Cherry Pie, created by illustrator Lee Gong. It’s the best representation of all the random cutesy vintage shops in the area. 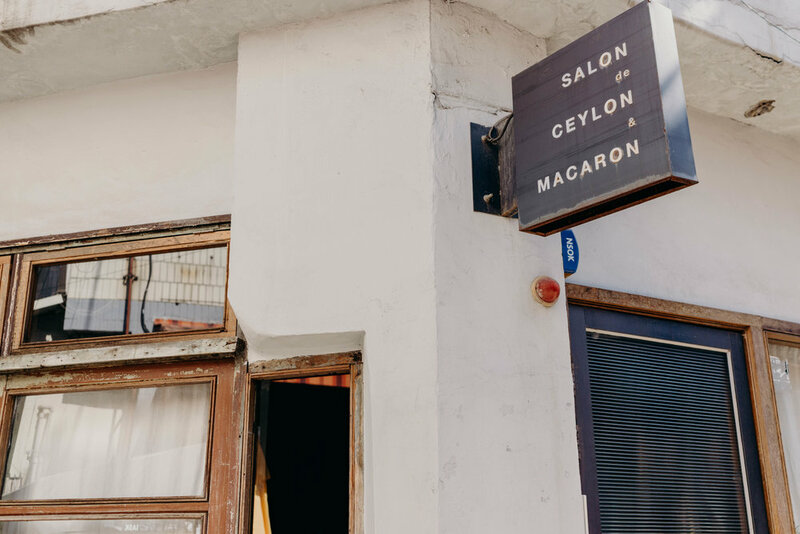 Within the vicinity, you can find SF Bagels, the best bagels we’ve found in Seoul, and a hole-in-the-wall that sells pastel de nata, or Portuguese custard tarts, which bring me back to our trip to Lisbon last summer. Don’t miss the burger house (can we say old-school NYC?) as you approach Hongdae.